Slice Spam into planks and cube into tiny cubes. In a large skillet, add olive oil and cook Spam over medium-high heat until it's browned and crispy on all sides. Remove from heat and let cool. Reserve a few for sprinkling on top of the donuts later. Working with one biscuit at a time, roll it out into a flat round and sprinkle a small handful of crispy Spam on top. Fold the biscuit over and reshape it into a round. Use a small cutter to cut a round out of the donut. Repeat, shaping all the donuts. 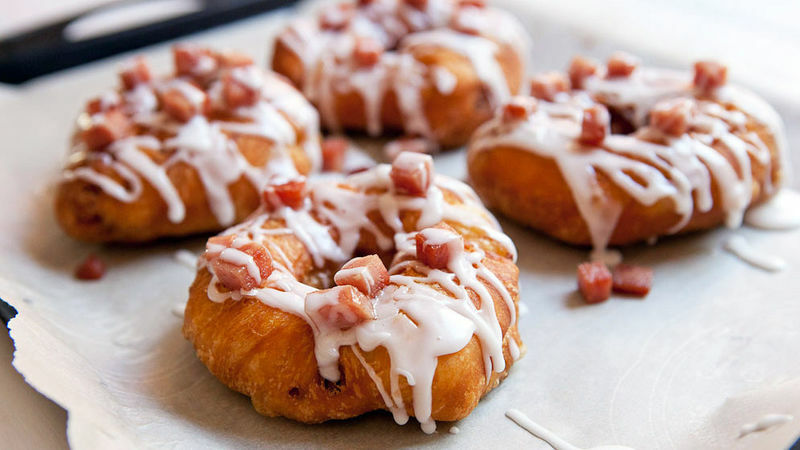 If the dough gets really sticky, flour the donuts lightly to prevent sticking. For glaze, whisk together powdered sugar and milk. Drizzle donuts with glaze and top with the reserved Spam cubes. Serve while warm. Use a deep fry thermometer to make sure your oil doesn't get too hot. These easy homemade donuts are filled with crispy cubes of Spam for a one-of-a-kind treat you won't soon forget! Here’s the important thing to note about this recipe: I’m not a Spam lover. I’ve had it a bunch of times in various forms and I can just never fully get behind it. BUT, I know that there are millions of Spam lovers out there, and this recipe is for you. The inspiration for these guys is from an ABC news article, and it just looked so crazy that I gave Spam another shot! After all, the donut is the ultimate test whether or not I like something. If I don’t like it in fried form, then I’ll never like it. Let's start with the main ingredient: Spam. Spam is pretty mushy. To counteract this, I really recommend dicing it up and crisping it up before you put it in a donut. It’s pretty easy to do. Just dice up the Spam and then cook it in a large skillet over medium-high heat with a drizzle of oil until the cubes are really crispy. No need to season – Spam is salty as is. Ignore the long strips in that photo. I was experimenting with what shape would work better in donuts, but the answer is definitely cubes, not strips! Speaking of donuts, I used a quick shortcut and popped open a can of Pillsbury Flaky Biscuits. These don’t have quite the sweetness of normal donut dough, but they'll work since we are going to glaze them heavily! Working with one donut at a time, roll it out into a flat round and sprinkle on some crispy Spam. Then fold the dough over and roll it out again until it’s roughly in a circle. Use a small cutter to punch a hole in the center. Once I punched a hole in each donut, I used my hands to make sure they were in roughly a donut shape. Heat your oil to 325ºF and fry these bad boys for 2-3 minutes per side until they're golden brown. Keep an eye on your temperature for the oil! If it gets too hot, the dough will just burn. Once they have fried, let them drain briefly on some paper towels. This glaze is super simple to mix up. It should be nice and thick and really stick to the donuts when you drizzle it on. Definitely serve these while they're warm. Even with my Spam aversion, I had to take a bite. Okay. They weren’t terrible. I think if you normally like Spam, you will love these. That’s all I’ll say about the situation! Nick isn’t sure that he is a Spam lover! Check out his blog, Macheesmo, and follow him on his Tablespoon Profile.